One of the first weapons to use a projectile as its instrument of death was the bow. The bow, combined with its accompanying ammunition, the arrow, is a dependable, lightweight, and portable hunting and self-defense weapon that’s capable of helping to both feed and protect you. We don’t know exactly when the bow was invented. As far as we know it predates all of recorded history. Despite the fact that it’s this old it’s still no less deadly. Today people use complex compound bows and crossbows for hunting as well as self-defense. The only issue with these weapons systems is their cost. Some of the more complicated systems can run you into the hundreds, if not thousands of dollars. Which is why a simple, low cost PVC bow is just what the doctor ordered. The PVC bow that you’re about to learn how to make is extremely simple to make. With this PVC bow in your possession you’re now equipped to do a number of things. First off you now have an efficient self-defense weapon. Obviously this won’t be nearly as efficient as a handgun or shotgun. But for considerably less, and without the red tape associated with owning a gun, you have a device you can use to keep you and your family safe. The second thing you have is a hunting weapon. This is where your bow will shine. Using bows in the great outdoors is a great way to land a dinner without disturbing others or letting animals know you’re there. That’s because bows are far quieter than firearms, which makes them great for crisis situations. The 40 lb. bow you learned how to make in the video above is perfect for small to medium sized game. If you want to get even more power you can double the size of your PVC and fiberglass rods to make that happen. Here’s the video on how to make a 70 pound bow. At the end of the day both of these are great for self-defense and hunting. In addition to owning a weapon like a bow or a gun, one of the other absolutely critical survival weapons to own would be a knife. Knives are arguably one of the most important survival tools to own. With a knife you could even make a bow out of wood if you needed, which is obviously a huge deal if you’re ever stranded in the wilderness and need to make a bow for survival. To see our full selection click here, or on the image below. 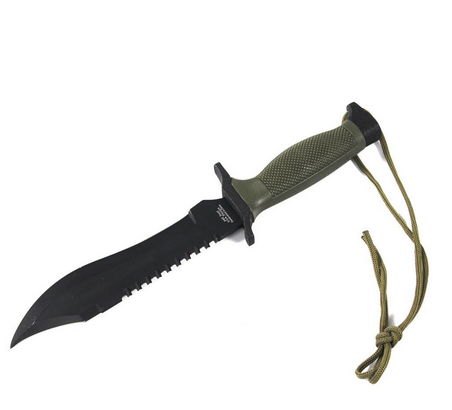 This entry was posted in Bushcraft, Emergency Preparedness, Emergency Survival, Self Defense and tagged hunting, hunting tools, self defense, Weapons on September 19, 2015 by Survival Frog.